One very good reason why the sedan isn’t ready to die. For 2019, the new Nissan Altima will be offered in a heavily equipped First Edition trim. The sedan is dead. Long live the sedan. Or so goes what currently passes for conventional wisdom, backed by the decision to slash the number of four-door models, indeed, eliminate them entirely at Ford Motor Co. But I have seen the future and it is not an entirely SUV and CUV-driven world. If the complete makeover that is the 2019 Nissan Altima is any indication, there’s a clear place for sedans for the foreseeable future. 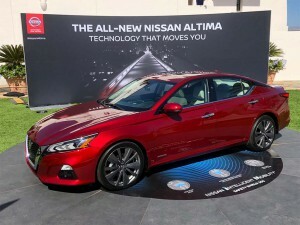 And among the many new features that would seem to make the Altima a natural alternative for Snowbelt buyers who might really want a more conventional set of wheels: Altima marks the first time Nissan is offering all-wheel-drive in one of its sedans. That is, in fact, a relatively rare feature among mainstream four-doors, and not available on segment leaders Toyota Camry and Honda Accord. There is, however, a lot more to like about the sixth-generation Altima, starting with its more stylish design, inside and out. 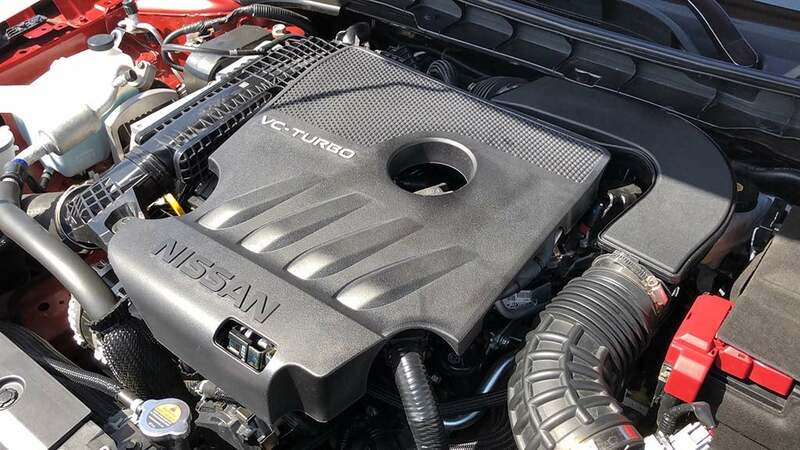 Though it no longer offers a V-6, the midsize sedan amply compensates with the first mainstream application of Nissan’s breakthrough Variable-Compression Turbo engine. 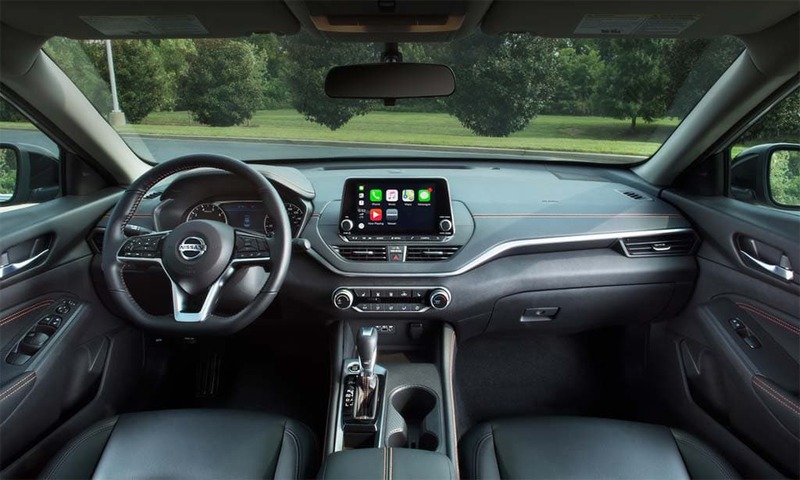 And there’s a lot more technology onboard, overall, including an array of advanced driver assistance systems that now come standard on mid and higher trim-level Altimas. A closer look at Nissan's breakthrough Variable-Compression Turbo engine. 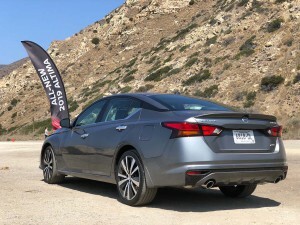 To get a feel for the 2019 Nissan Altima we caught the early morning flight out to Santa Barbara, California, setting out from there on a wandering journey that took us through inland hill country, some of it badly scarred by recent wildfires, before a final meander up the sunny California coast. While we’re looking forward to having more time in the Altima, our early experience was almost entirely positive, with only a few minor quibbles. There’s no question the sedan market has been losing momentum as millions of American motorists trade-in on SUVs and more car-like crossovers. That’s been especially true in the midsize segment largely populated by family buyers. They’ve been drawn to the higher seating position, as well as the AWD, offered by utes. There’s not much you can do about seat height. You simply won’t be able to match it with a sedan, though the counter-argument is that the lower center of gravity of a sedan translates into better vehicle dynamics. 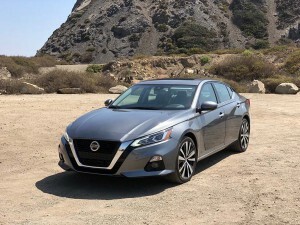 And that’s something that Nissan designers and engineers set out to take advantage of with the 2019 Altima makeover – which rides on an all-new platform developed at Nissan’s Michigan engineering center specifically for the U.S. sedan. The platform has a two-inch longer wheelbase than the outgoing Altima, and it gains an extra inch in width and overall length, though height drops an inch. The 2019 Nissan Altima's wheelbase grows two inches, room captured by a more spacious interior. Among the current crop of mainstream midsize models, we found the 2019 Altima to offer perhaps the most pleasantly well-planted driving experiences, especially with the sportier SR trim level. Steering, across the board, was more precise than with past versions of the Nissan four-door, with relatively little body roll until you started pushing out towards the limits while cornering. The AWD system, meanwhile, did a yeoman’s job of directing torque to where it was needed, though power is normally directed to the front wheels under ideal driving conditions. There was little sense of pushing as we entered corners, an issue that plagues more than a few competing AWD systems. Our most immediate complaint concerns Nissan’s decision to only offer the AWD system as an option with the Altima’s base, 2.4-liter naturally aspirated inline-four. At 188 horsepower it can reasonably handle the mass of the new Altima, but sporty is not a word you’d likely associate with that engine, especially when you have the added mass of the AWD system. You do get good, if not benchmark fuel economy. The front-drive package gets an EPA rating of 28 mpg City, 32 Highway and 29 Combined, the AWD rated at 26/36/30. The new Altima is Nissan's first sedan offered with all-wheel-drive, but only with 2.5-l engine. More good news: Nissan’s updated continuously variable transmission all but eliminates the rubber band effect you normally experience with a CVT. The CVT seems to be even more well-adjusted when paired with that 2.0-liter VC-Turbo engine, tuned to function more like a conventional step-gear transmission under hard acceleration. And power comes on quick, the VCT topping out at 248 hp and 280 pound-feet of torque. For those not familiar with the concept, conventional engines have to make compromises, among other things locking in a specific amount of compression in their cylinders intended to strike a balance between performance, mileage and emissions. The Variable-Compression Turbo, on the other hand, is designed to continuously adjust that ratio anywhere from eight to 14-to-1. It’s a concept automotive engineers have tried to perfect for decades. Nissan finally pulled it off, debuting it in last year’s Infiniti QX50 and now adding it to a Nissan brand model for the first time. There is a drawback, however. To get maximum performance and the rated 25 mpg City, 34 Highway and 29 Combined mileage numbers requires premium fuel. But the VCT will run on regular, if need be. Nissan planners told us the VCT may eventually get AWD, though they initially decided to launch the system on the 2.5-liter system to hold down costs and make it available to the maximum number of buyers. We’d have gone the other way around. A more distinctive take on the familiar Nissan V-Motion grille debuts on the 2019 Altima. Okay, maybe we do get it. For midsize buyers, price is a big issue, and adding AWD to the VCT would push the MSRP on the new 2019 Altima way up. As it is, the sedan starts at $23,750, putting it in a sweet spot for the U.S. market. That jumps to $31,780 for the top-line Platinum edition – with a sticker of $35,750 for the limited-production Altima Edition One that will be offered only for the 2019 model-year. We spent a good portion of our drive in that limited-edition package as it gave us a chance to experience all the many other goodies Nissan has come up with for the gen-6 Altima. Stepping back a bit, we should consider the new model’s design. The overall visual theme was “sleek, stylish, spacious,” according to the automaker’s design team, and they largely pulled it off, relying on an intense competition between Nissan’s various design studios to craft the right look. The final design, it turns out, emerged from the design studios in San Diego. Up front, you’ll immediately notice the larger and more aggressive take on the familiar Nissan “V-Motion” grille, here framed with thinner headlamps that flow back into the front quarter panels. 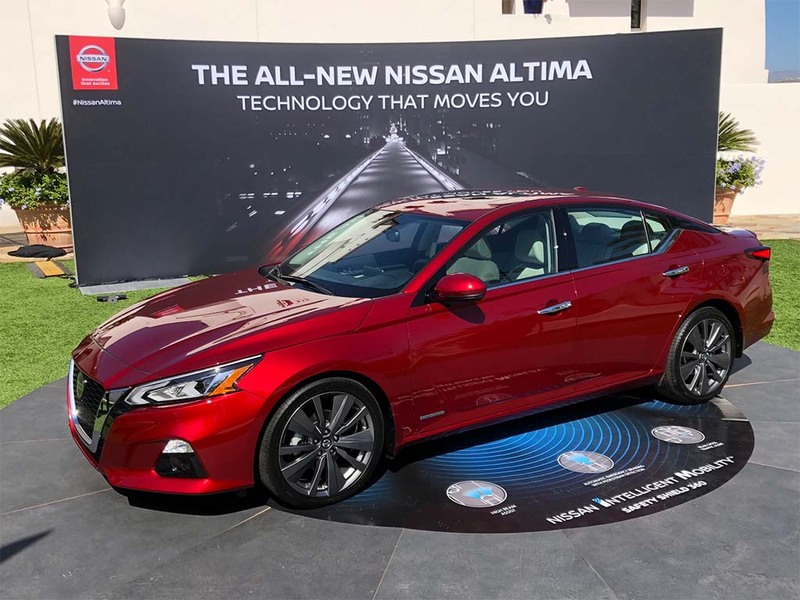 The 2019 Altima has a more coupe-like silhouette that lifts the “floating roof” look previously seen on the bigger Nissan Maxima, as well as the Murano SUV. From the rear, there’s a built-in spoiler lip on the decklid, and a splitter underneath to improve under-body airflow. A variety of different wheels and tires are available, ranging from 17 to 19 inches, the latter size enhancing the car’s planted and sporty appearance. The 2019 Nissan Altima is loaded up with an array of powertrain, safety and convenience technologies. While the Altima’s looks will likely get you to check the new model out it’s the sedan’s technology that will get you to stick around. That, as we said, starts with the new VC-T engine and AWD, but there’s more just about everywhere you look. Inside the well-appointed cabin, with its double-stitched seats and instrument panel, you’ll find that even base models get an 8-inch touchscreen display atop the center stack, as well as a 7-inch display for the instrument cluster. Indeed, base models also get a power’s driver’s seat, a rarity at that price point, as well as four USB ports and remote engine start. The base car also gets a few, welcome high-tech safety features, including automatic emergency braking and a backup camera. You have to move up a few trim-levels to get the full Nissan Safety Shield 360 suite of ADAS systems, however. Those include not only emergency braking but blind-spot detection, lane-keeping assistance, rear auto-braking, rear cross-traffic alert and more. The Nissan Intelligent Drive system adds still more nice touches, such as Nissan Pro Pilot, which helps you maintain your position in the center of the lane, and which can also bring you to a full stop in traffic, starting back up when the vehicle ahead begins to move again. 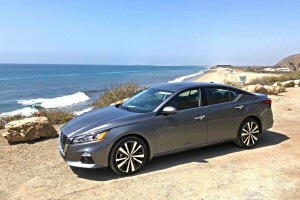 Nissan is confident enough to bet that it can maintain, and actually even boost, sales in a fast-declining market segment with the 2019 Nissan Altima. Even if it just holds demand at current levels that would be reason to celebrate. The good news is that the sedan has pretty much all the right things in place to pull that feat off. It’s a good looking sedan that offers a competitive price, good mileage and lots of desirable new technology, whether you’re talking powertrain, comfort and convenience or powertrain. If you’re still in the market for a four-door, it’s worth putting the Altima on your shopping list. With more new models like the new Nissan Altima, we’d be willing to wager that sedans just might pull off a revival. This entry was posted on Friday, September 28th, 2018 at and is filed under Automakers, Automobiles, Business, Crossovers/CUVs, First Drive, First Look, Honda, Infotainment, Markets, Nissan, Reviews, SUVs, Safety, Sales, Sales, Semi-autonomous Driving, Technology, Toyota, Trends, U.S./North America. You can follow any responses to this entry through the RSS 2.0 feed. Both comments and pings are currently closed.